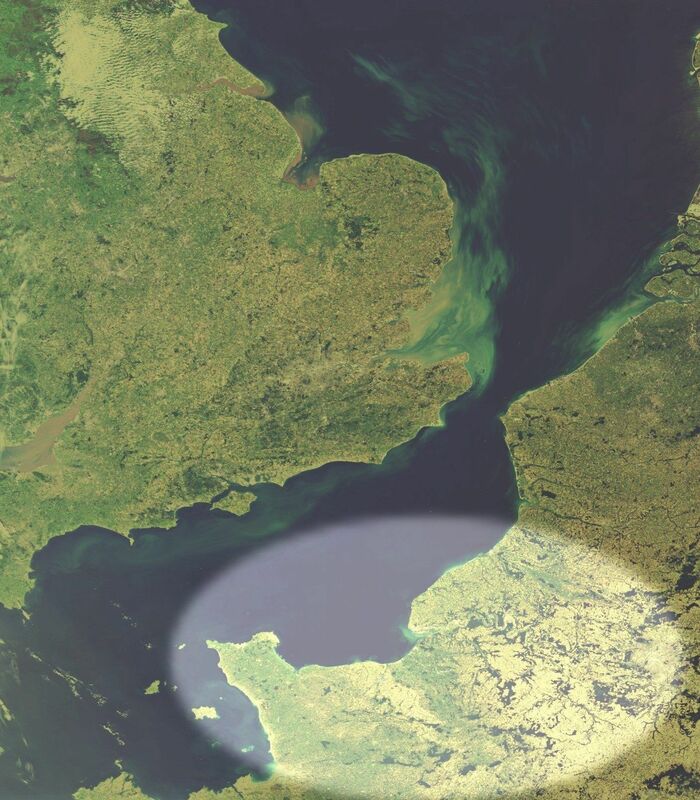 The seventh annual Bible Exhibition (Expo-Bible) was held in the sea-side town of Houlgate in the region of Normandy, France during August 2014. The exhibition was open to the public from Wednesday, August 6th through to Wednesday, August 20th but we did have a few visitors on the day before we officially opened! 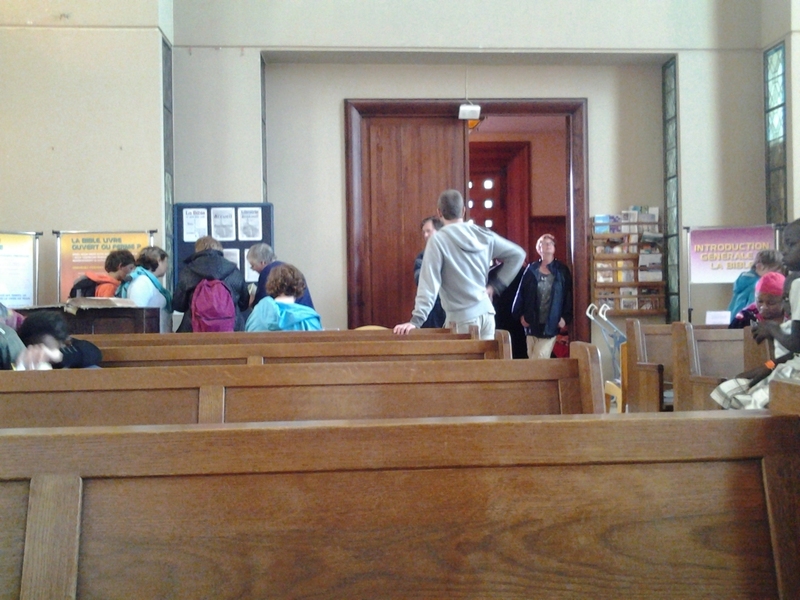 They wandered in while the church doors were open when we were still doing the final preparations for the exhibition. This year, as in previous years, the majority of visitors came from a background of no real contact with Christianity, followed by those who had a background in the Catholic church, which contact they may or may not have kept up in adult life. A few had connections with protestant or evangelical churches, and who attended church regularly. This summer a total of just over 370 people visited the exhibition, which is a daily average of about 25. We had about 10% more visitors this year (2014) than visited the exhibition last year (2013). The total number of visitors that we have had over the seven years that the exhibition has been held amounts to over 3,250. This does not include people who have come into the church just to look at the architecture, or to just sit in a pew and meditate, or those who have looked at the start of the exhibition and decided that it wasn't for them and left. We only counted those who go round the majority of the exhibition, or who engage with the team in some meaningful way. There was an Iraqi/Kurdistani man who visited the exhibition. He was from Paris and was in Houlgate on holiday for a few days with his teenage nephew and niece. The holiday was coming to an end, and the teenagers were about to return back to their home in northern Iraq. This area was in the process of being taken over by the militant group known as Islamic State, and their reputation for persecuting or even murdering Christian groups, among others, was weighing heavily on the mind of the uncle. He was very keen to get as much of the gospel and the Bible into their minds before they returned home and brought face to face with the Islamic State terrorists. On another day we were visited by Jose. 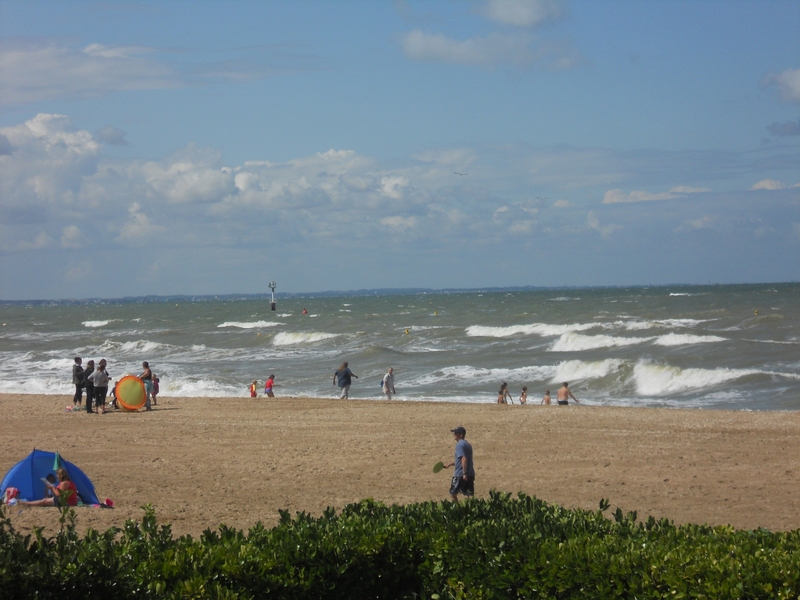 He was a Portuguese coach driver, who had brought a group to Houlgate to enjoy the beach for the day. While he was waiting to take his passengers on to their next destination, he sat in church. Tim, one of our helpers, had a long chat with him. Jose was brought up a Catholic, but because of working away from his home so much, he said that he had lost touch with his roots and with his faith. He bought a Bible and two Christian books: "Où est Dieu quand rien ne va plus?" (Where is God when things go wrong?) and "Si Dieu est bon pourquoi la souffrance?" (If God is good why is there suffering). His choice of books maybe reflects some of the problems he was wrestling with as he sat quietly in the church at Houlgate that afternoon. The Invasion from the Beach! On the second Wednesday of the exhibition (August 13th), what started as a fairly fine day turned into a very showery day, with a sudden torrential rain squall sweeping in across the bay, driving people off the beach very quickly. 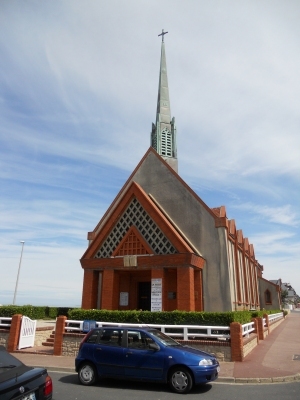 One large group of people, who turned out to be visiting Houlgate for the day from a suburb on the east side of Paris, rapidly left the beach to take shelter on the porch of the church. As more of them arrived, and as the rain came down harder, many moved into the foyer of the church, and as that became packed full, into the church itself. At first this led to total chaos, especially as there many children who thought it fun to run around and play in the church, bumping into the exhibition display and each other with alarming frequency. Finally someone "in charge" was identified and order was restored. 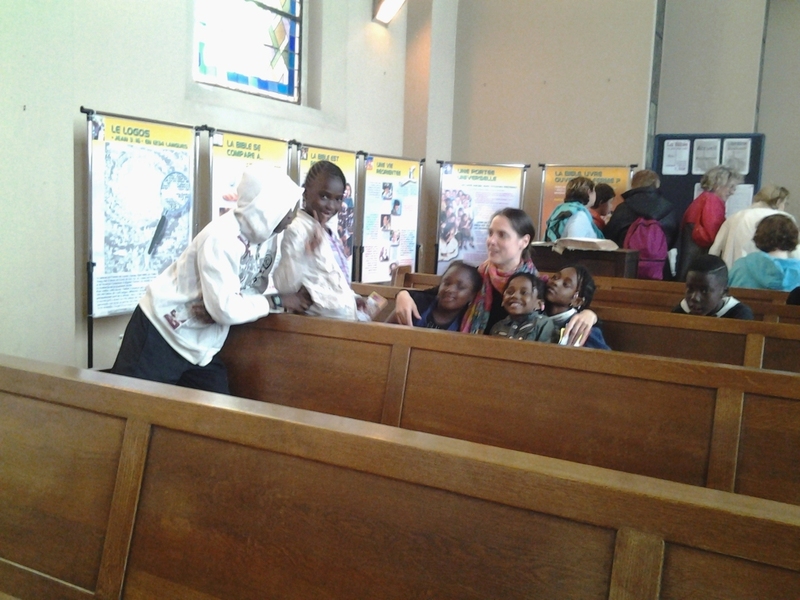 This allowed the team members many opportunities to talk to some of the "invaders", and for some of them to sit quietly in the pews reading the free literature and gospels, either for themselves, or to keep their children calm. One of our helpers, a young French lady from Paris, got a group of the children together and read to them simple Bible stories. Other team members engaged in conversations with the adults. The majority of the group seemed to be from a North African background in terms of ethnicity and were Muslim in terms of their religious background. This may well have been their first, and maybe only, opportunity to hear stories of Jesus being read, and to read or hear about the Christian faith. An older lady from Paris, Joelle, came in to look around the exhibition. She was very interested in Buddhism. Pam, another of our helpers, was able to have a long chat with her about Jesus. She was able to emphasise the vital importance to the Christian faith of who Jesus really is, and the centrality of faith in him, who he claimed to be, what he did, rather than the Christian faith being just acceptance of a certain set of ideas and teachings. Joelle took copies of the four gospels to read, with their emphasis on who Jesus is and what he has done. 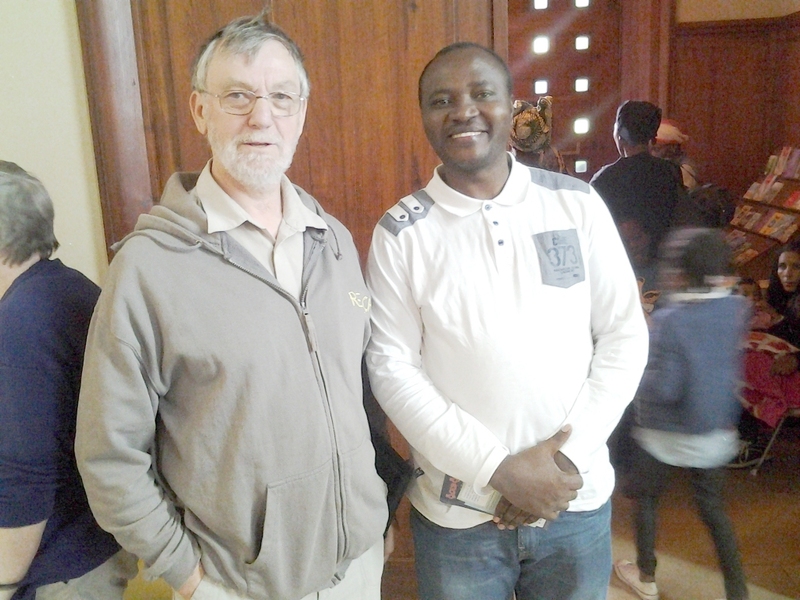 A French Christian father visited the exhibition twice during the week he was staying in the area on holiday. He said that his two teenage daughters had reached the age where they had stopped going to church. This was probably due to the influences of the education system and peer-pressure. Despite his encouraging them to continue attending church, they had declined, and were drifting away from any links with church and faith. He spent time talking to team members about his situation, and what he could do to help them. He bought several books from the book stall, spending over 30 euros. He bought books which he hoped that his daughters could be encouraged to read, or that would help him find ways to continue a dialogue with them. 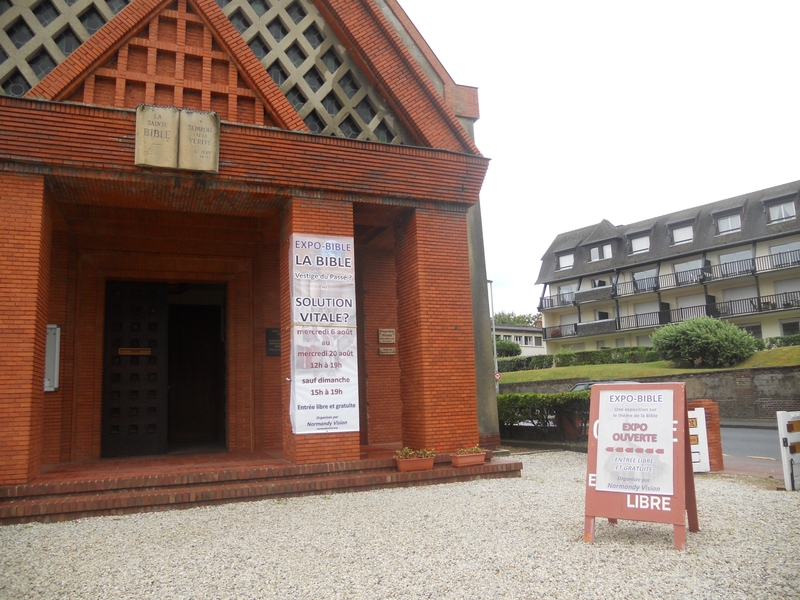 "We arranged to stay in a flat just across the road from the church. On our arrival on Saturday morning the owner showed us around but as we left another lady and her daughter were waiting outside. They also had booked the flat for this week. The owner had forgotten to transfer our booking from one diary to another. When we enquired about alternative accommodation, the owner of a neighbouring hotel assured us there was no chance of finding any that week as it was the 15th August, feast of the Assumption week. The owner was extremely embarrassed. We were facing a major problem. The owner, a lady, then suggested we stay with her and her nephew in her two-bedroom flat. She invited us, two complete strangers, to spend the week in her personal space. She had to rearrange the bedrooms and her nephew had to sleep on a settee. One evening I showed her a powerpoint of the work my son has been doing as a New Tribes missionary in a Papua New Guinean tribe. She was amazed at the sacrifice involved and the impact of the Gospel on this isolated people with their unknown, unwritten language. At the end of the week, which went well, she accepted a New Testament which we had left on the table for her as well as a copy of "The Stranger on the Emmaus Road" which explains the key teachings of the Old Testament and then presents Jesus Christ as the fulfilment of the Messianic prophecies. As we left she invited us to stay with her in Paris if ever we were visiting the city." Tim summarised their experiences like this: "What started as a potential disaster became an opportunity for the Gospel." Our count of 374 visitors does not include any of the large number, young and old, who "invaded" the church on that Wednesday. We only count those who go around the exhibition, and they did not get the opportunity to do that. However many of them read the literature that was on display in the church and in the foyer, as well as those in the church who had conversations with team members, or who read stories to their children, or who were part of the group that listened to one of our team reading Bible stories. In 2014, as in previous years, there were many visitors from a wide range of backgrounds and nationalities who had the opportunity to discover more about the Bible, about the gospel, about the Lord Jesus. Many took tracts and free gospels to read; many bought Bibles and Christian books. There were many conversations between visitors and team members. Those who were not believers had the opportunity to be challenged and to learn more. Those with church connections but maybe not a personal faith in the Lord Jesus had the opportunity to see the importance of a faith that is more than a social facet of their lives, or something just in their heads. Those with a real, personal faith in the Lord Jesus were encouraged and strengthened in their faith and understanding. How much impact does the exhibition have on people? Some find it so valuable that they come back year after year. One example is a catholic family - dad, mum and teenage daughter. This year was their third visit to the exhibition. Why did they keep coming back year after year? There was so much to learn about, too much to take in during one visit, and they wanted to find out as much as they could. They asked questions about the Trinity and about Mary, interested in discovering what answers the Bible has to these questions. 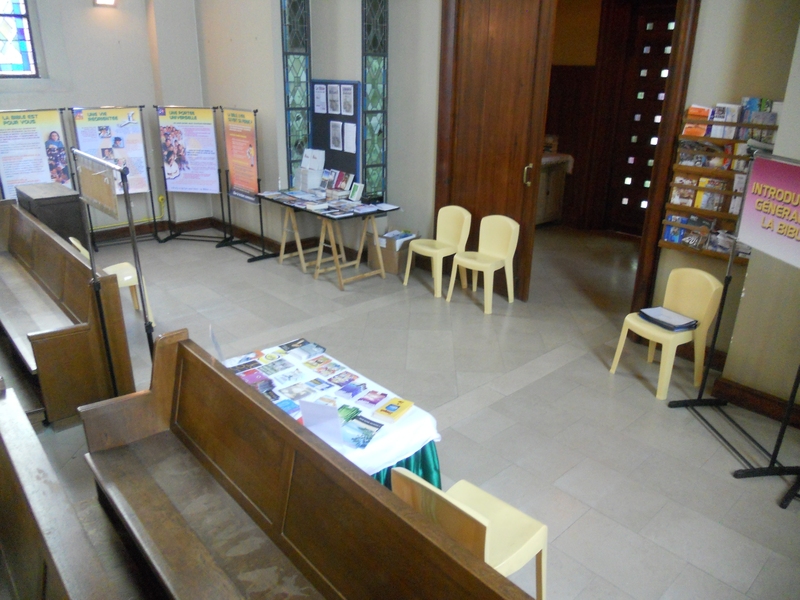 The Bible Exhibition offers opportunities - many different opportunities to many different people. What do the visitors make of these opportunities? In a few cases we get to meet the people again and so find out the answer to that question. In the majority of cases though we never find out the answer. But we - and you - can pray that the Lord continues to work in their lives, so that seeds of thought or faith planted in minds and hearts at the exhibition would be watered and germinate and in the end bear fruit: fruit in their lives, fruit that brings glory to the Lord Jesus Christ. 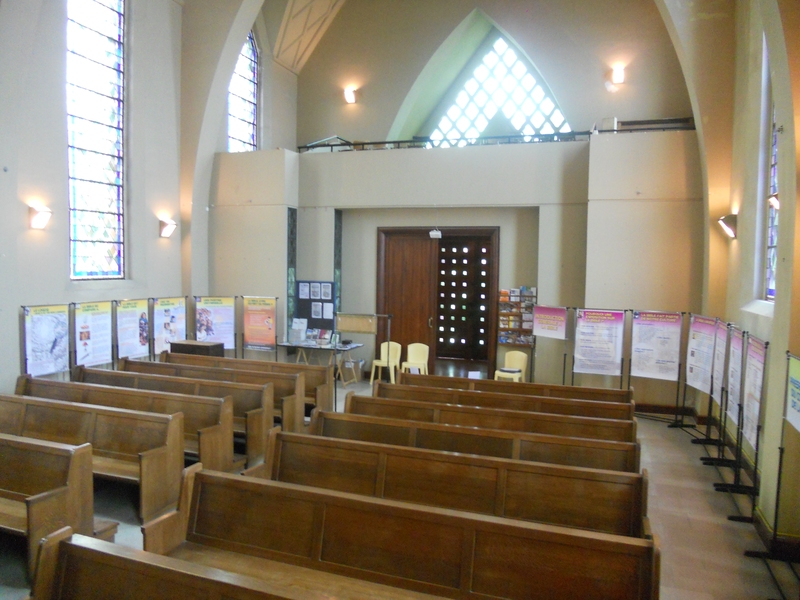 And that essentially is the purpose of the exhibitions that have been held in the church on the edge of the beach in Houlgate, Normandy for many years: that an opportunity would be given to people to discover more of the Bible, and through that to learn something of the gospel, and through the gospel to come to know Jesus Christ as their Lord and Saviour. This year over 370 people, together with the many who came into the church on the afternoon of "The Invasion from the Beach", were given that opportunity. Please pray that their opportunity would not slip from their memory and thought, and that they would respond to what they read and saw and would want to take it further, and, as a result, come to faith in the Lord Jesus Christ.